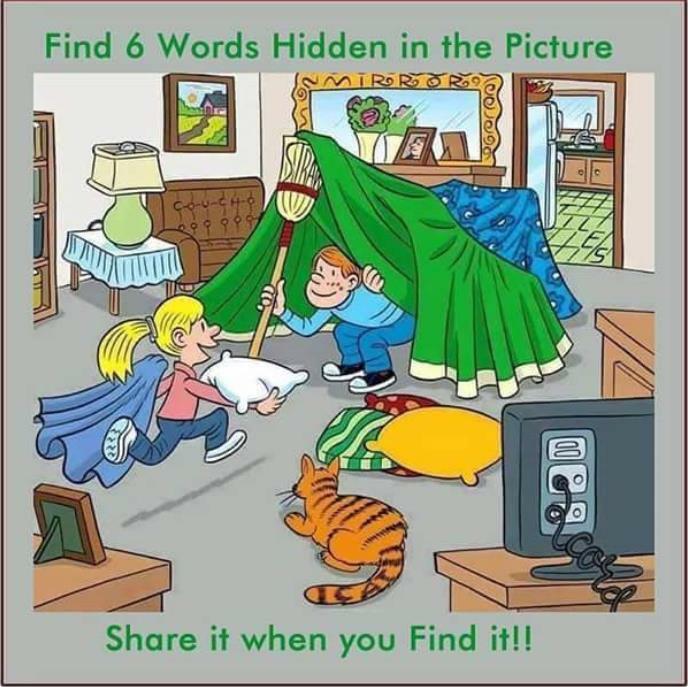 I found 5 out of 6 words *Sad face* Let's see who will be able to find all the 6 words in this picture. Please write the words you have found in the comment section below. Couldn't see nothing aside the questions itself. Lol. If you look closely dear, on the green floor you will see - TILES (1), on the tail of the cat you will see - cat (2), on the mouth of the broom the boy is holding, you will see- STRAP (3), on the mirror, that's the wood used in designing the mirror, you will see - MIRROR (4), on the brown couch, those things designed as buttons the first layer, it is spelt - COUCH (5). Interesting dear. Please where did you find the telephone?